This mens Aquaspeed is a fantastic blend of fashion watch and basic sports function with its black and silver colours. Just what I was looking for to replace another Rotary watch I purchased over 30 years ago. The last one was very robust as is this one. Fast delivery from Watch Shop and appreciated their service of adjusting the size of the strap to fit my wrist. I love this watch. It is an elegant and versatile watch that you will feel proud to wear. Great looking watch. First bracelet strap Ive worn - always gone for the leather strap. Was apprehensive wether or not it would be my style and comfortable to wear. It looks fantastic and feels even better. Its got a lot of weight behind it but uncomfortably heavy. The dials are clear and visible so telling the time at a glance is not a struggle unlike some watches Ive worn..!! The date display is rather small but nevertheless accurate and readable with bit of a squint. All in all a lovely watch and a pleasure to wear. Great watch for the price. Although only worn for a month looks like it will last for a good few years. Ive only had the watch a couple of weeks and so far am very impressed! Its not too heavy, and sits comfortably on wrist. 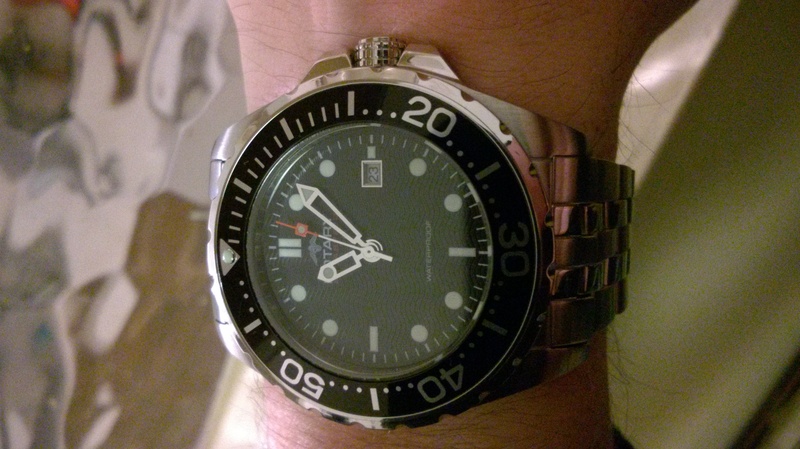 This watch is great if you can not afford the Omega Seamaster James Bond watch! It is almost identical. All in all it is a watch that tells the time! The dial is clear, with luminous digits and hands, and the date can be clearly read. I doubt I will use the bezel but it rotates in one direction, and does look cool on the watch! I have yet to test it in water, but I like it so much I dont think I want to get it wet! The watch certainly looks sophisticated, and the black and silver just make it look expensive! The watch strap is comfortable on the wrist, however I find the clasp frustrating to open, to get the watch off. It certainly makes it secure on the wrist. Some practice is needed to perfect the art of taking it off, you have to press two side buttons, and unhook clip to free the strap. I really can not fault this watch, and I would certainly have a Rotary watch again. The watch looks great, and worth every penny. Watch was delivered within 24 hours as promised. Really smart looking watch. Husband very pleased. Willl use this site again and recommend to friends! After searching for a new watch for a while i saw the Rotary Aquaspeed and just had to buy it and i am so glad i did. Firstly this is a stylish watch and vey eyecatching, it has a nice weight to it and you know your wearing a watch without being to heavy,the bracelet is a nice brushed finish while the inner links are shiny and stand out. It has a nice black face with subtle wavy lines and easy to read hands also the second ticks nicely onto the markers. The date is a bit small but still readable and the hour markers do actually illuminate in dull light.The black bezel clicks as it should do and stands out, it also has a screw out crown and hack mechanism and very nice Rotary markings on the back and the clasp ,it comes in a nice presentation box so perfect as a gift. One point i would mention is the bracelet is quite big and there is not alot of adjustment so you may need to have it adjusted but it does sit well on the wrist, all in all a very nice watch at a great price that looks more expensive than it is. Buy one you wont be dissapointed. Also i had a trouble free transaction with good communication and the watch was delivered the next day, so well done i will definately be using the watch shop again. Hope this helps when choosing a new watch. The watch has a real quality feel about it. The strap has solid links and a mirror lusture mixed with a brushed steel surface. Only minor grumble is that the hands can be a little difficult to read in low light conditions if they are not charged with light first. I live in Hungary. I ordered it on last Saturdey night and I have received it on this day (Friday). It is a beautiful watch. It looks good and very pleasure to wear. The strap is too long for me but it's not critical. Thanks for it! This is a great watch at a very good price nearly £40 cheaper than a jewellers and 20 times cheaper than a seamaster although very similar. Watch is clear and easy to read/use even at night, strap very comfortable and the black/white face looks good. Good build quality,comes with stamped warranty and presentation box.Worth buying online as you have right to change mind, but your bound to keep it. I recently purchased the Rotary Aquaspeed / Model AGB00013/W/04, it is a very well priced watch and looks amazing (to lookat, it is much like the the Omega Seamaster as made famous by James Bond) fortunately though, this watch is very affordable. I love the wavey lines on the dial, my only critisisms of the watch is that I could only get it with a black face "I would have got blue if the colour choice was available". The look of the watch features a blend of characteristics that are very similar in comparison with some Omega and Breitling watches (e.g. Omega wavy dial, gladiator sword type hour and minute hands and Breitling chunky crown and red square ended second hand), I think this style is new for Rotary as they have been traditionally very dressy looking watches rather than the rugged yet sophisticated looks of high-end watches which always look good wether you wear it with a suit or casually in tee and jeans. 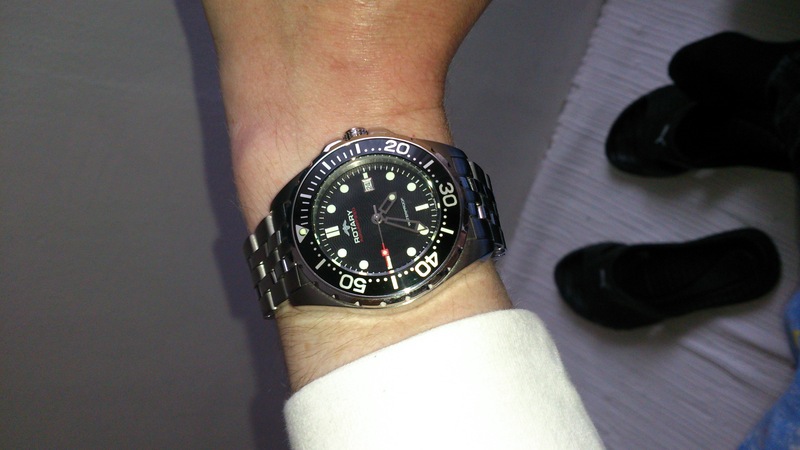 I love wearing my Rotary Aquaspeed as it does attract some attentention and when I tell people it's actually made by Rotary and the price I paid for it, Most can't believe it as you get a lot of watch for the money and if it gets damaged through being worn too much, it is easilly affordable to buy a new one. The watch movement is quartz and I have found it to be a very accurate time piece, I also like that the second hand actually points to the second indices which a lot of watches don't, this little functional detail also has the characteristics of more expensive Swiss watch brands. To anyone thinking about buying one,yeah.., I reccomend it if your'e like me and love collecting watches without breaking the bank!!! I had been thinking about buying a stainless steel sports / divers watch for a while. I've always had a fascination with watches and have owned many prestigious models over the years including Rolex, Bulgari etc. When I have a spare 5 mins I sometimes Google watch sites and stumbled across Watch Shop and was immediately impressed with the site and choice of brands. I was originally thinking of buying a Tag Heuer but after a bit of browsing on the Watch Shop site was impressed by the Rotary range and in particular their Aquaspeed range. I narrowed search down to either this watch or similar with chronograph but thought the dial on this one was clearer, simple and stylish. I was a bit concerned about quality as the watch costs about a sixth of the price of a similar looking TAG but was reassured by guarantee and exchange policy so went for it. Ordering process was easy peasy and watch turned up next morning, sized to fit my wrist, time set and ready to start enjoying. My only slight worry was watch face looks a bit smaller online but once I started wearing I got used to it. I'm now wearing every day and have already had several envious comments from mates who think it's a really cool watch. If you're looking for a timepiece that looks the business but doesn't cost the earth you won't go wrong with one of these! I was looking for a really nice watch to purchase for my partner for his birthday. I had looked at the high street jewellers but could not see one I really liked. I then did a search for the make of watch on the internet and came across Watch Shop. What a find, excellent prices and great choice. I placed my order yesterday afternoon and the watch arrived well packaged by special delivery at 9.00 a.m. this morning. The service was excellent with email and text confirmation at point of dispatch. I would certainly recommend and use Watch Shop again. Excellent service. Watch was received w/in 24 hours of order going through. It is a beautiful watch. I took it to a depth of 4 ATM while scuba diving, and it handled itself admirably. Rotary watch co. states that this is not a dive watch, and will not tell me to what depth it is waterproof, so I guess I will be experimenting with it. I know that I will not be going any deeper than 60 meters, and I believe that the watch can handle this. It is a very sturdy watch.